The innate power of Social Media to impact continuously and effectively on our thoughts and actions is immense. That is beyond dispute. Businesses, organizations, groups and individuals needing to get their message across need, firstly, to recognize the fact that Social Media Marketing occupies a dominant space on the Internet and offers enormous opportunities to businesses to impact on an unlimited market. Internet Marketing is not new but it is a growing phenomenon and now occupies a dominant space in the minds of the populace searching for goods and services across the globe. This online space is populated predominantly by Millennials but is increasingly utilized by Businesses and Entrepreneurs who seek to use the unparalleled opportunity to engage in online marketing and maximize their reach to the global market. The next step is to harness that phenomenon for the good of your business or your cause. Our Social Media Marketing Experts are adept at using Social Media as a tool and effective strategy to ensure our clients can deliver the right message to the right people and the right time no matter where they are in the world. They utilize the power and potential of Social Media Marketing to impact on the lives and experiences of people globally. Contact our Social Media Marketing Experts who will help you achieve a market dominating position for you and your business using the power of Social Media. All Marketing, Online Marketing and Offline Marketing should be part of a defined Marketing Plan. That Plan should be carefully and painstakingly structured following an analysis of the vision, goals and objectives of the enterprise and consider and provide for a significant internet marketing presence. Given the extent to which businesses are now migrating to Online Services and the rising influence and impact of Social Media and Digital Technology it is imperative that the Plan would incorporate their potential and utilize their impact in the accomplishment of objectives. The sophisticated technology and the expertise of our experienced personnel is available to our clients to help them maximize the opportunity to acquire an Optimized Website. With the appropriate functionality and capacity to target a global audience, it would assist our clients to achieve maximum impact and would help generate more leads, attract more clients and customers, increase transactions and sales and grow support and profits. Our unique support for our clients to help them, (if they require such assistance) with their Marketing Strategy is of particular value to Start-Ups and who wish to grow their businesses. Contact of Social Media Marketing Experts for detailed information on ways we can help your business or enterprise achieve success in reaching your target audience and generating response from your customers and clients. 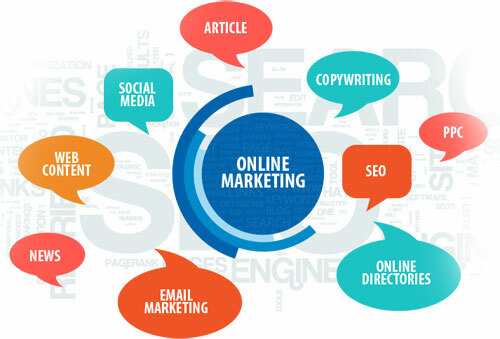 Online marketing is the best means to stay in touch with the ever-increasing customer base in the online ecosystem. The customer base online has crossed the billion benchmark and online marketing is indispensable for targeting all these citizens. Online marketing enables the companies to easily target the right audience using the right practices. The various analytics and tracking tools in online marketing prove helpful in determining target audience and generating leads. There are various new practices and strategies in online marketing that can be effectively implemented to boost the overall marketing efforts. They can amp up the marketing efforts and help businesses target their customers easily. Tracking the marketing efforts and analyzing the success metrics is important for growth. Online marketing enables the marketers to gather various metrics, analyze them and use them effectively for better results. Online ecosystem bestows the marketers with the opportunity to choose from a hub of media. With online marketing, companies can interact with their audience through various mediums effectively. Online marketing facilitates direct interaction with the customers. Marketers can get instant feedback from the customers as the internet offers a direct channel for interaction and communication.